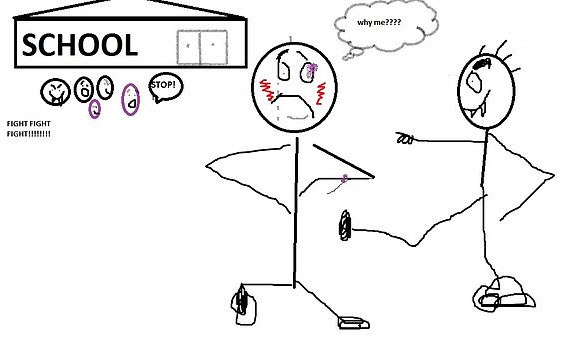 School bullying. Some just say it is part of school life, but for many kids it represents a form of pure mental and physical torture that in extreme cases is enough to result in suicidal acts. Sadly, over 20% of bullying victims actually consider suicide as a way out of it. Victims may also lash out with violence, such as school shootings that are often connected with bullying. Schools definitely need to take responsibility and deal with the situation better. According to dosomething.org, over 3.2 millions kids each year are bullied. Every day about 160,000 kids are not attending class because of bullying. Close to 20% of all students report being bullied 2 or 3 times each month. 90% of students in grades 4-8 report being a bully victim at one time or another. Cyberbullying is a newer form of harassment that just makes the problem worse, since it allows a much wider group who may not even know each other to participate in the bullying. 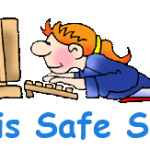 Online bullying can take the form of e-mails, text messages, instant messages and chat rooms. Cyberbullies might post private pictures and text about the victim, or in some cases masquerade the identify of the victim and post hurtful things that appear to come from them. The impact of cyberbullying can be very far reaching with the speed that content can spread online. Kids are often scared to tell adults about the bullying with only 1 in 3 of them talking about it. One of the most startling statistics relates to teachers. Only 4% percent of teachers will intervene when bullying is taking place and a quarter of teachers surveyed see nothing wrong with it! Schools must be held responsible. Parents trust that their children will be properly cared for when they are dropped off. How can we expect students to focus on studying and achievement when they are often afraid to even attend class? Lost, missing or destroyed books, clothing, etc. Students that often complain about being sick, or try to fake an illness. Skipping meals. Avoiding school lunches. Hiding in the library for safety. Declining grades. Not wanting to go to school. Sudden loss of friends or avoiding social situations. Destructive behavior, such as hurting themselves or taking about suicide. How do we go about protecting our children? We at KidzSearch see two main solutions. The first would be to just police the schools and take action whenever warning signs are noticed. The second approach would rely on better communication. The former approach might be best when dealing with severe bullying. Physical abuse should not be tolerated. Schools need to report them to authorities for further action. While it may seem harsh, it is actually no different than what would take place in any company or business if an employee became physically abusive towards another employee, or even gave verbal threats. Teachers are often the ones most likely to see bullying and need to take action and report it before it gets out of control. However, the same holds true for any school employee. It should be part of their job description. Those who don’t follow it risk losing their position or other disciplinary action. When students see the serious outcomes from bullying, such as getting publicly arrested in front of others, or perhaps even getting expelled from school, they are going to be much less likely to do it themselves. Perhaps a three strikes law is appropriate, so they get up to two warnings before police authorities are called. However, if a child is getting physically abused by a bully, justification to report it without any warnings seems appropriate for the safety of the student. Other students should also get involved. Anonymous tip lines can be set up to protect those students who care enough to report it. 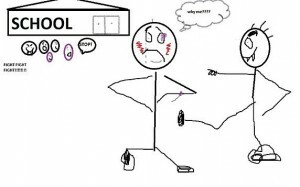 Bullying rarely happens in isolation, so it is very likely that other students are aware of the bullying and can report it. Telling an adult when they see bullying. Being friendly to the victims and letting them know it that it is not their fault and that help is available. Encouraging other students to get involved and speak up about bullying. Perhaps the best approach is a mixture of policing, better communication, and finding ways to boost the self-esteem of bully victims so they are not as likely to be as much of a victim. Here are some good resources for getting more information about bullying. Bystander Revolution – Great site devoted to anti-bullying. DoSomething.org – A site with over 4 million members helping to stop bullying. StopBullying.gov – Government website for getting help. If a student is being seriously bullied and perhaps possibly thinking about suicide, these are some helpful phone numbers and links they can use. If the issue is urgent, 911 or local police should be called. Important help for anyone in a crisis situation thinking about suicide. Topics they handle include addiction, relationship and family problems, sexual orientation, abuse, depression, and loneliness. Crisis intervention and suicide prevention services for lesbian, gay, bisexual, transgender and questioning young people. Student hotline for safe anonymous reporting of threats and violence in school and their community. Help with depression, cutting, eating disorders, addiction, violence, sexual abuse, bullying, family relationships, and other issues. Support and information for children and those concerned about them. Support for teens in relationships. 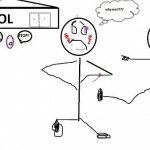 This entry was posted in Student Safety and tagged bully, bullying, children, kids, name calling, problem, school, suicide on June 30, 2015 by kidzblog.